ADURA Max is available in today’s most popular decors and features our innovative HydroLoc™ waterproof core—making it the perfect choice for your most challenging rooms. Thicker and more rigid than ordinary vinyl, ADURA Max is available in easy to assemble 6” x 48” locking planks that include our premium, Ultra-Quiet™ attached pad for superior sound reduction and greater comfort underfoot. Planks can be installed quickly on all grade levels and over most existing floors and subfloors. The result is a beautiful, durable, quiet and comfortable floor that can be enjoyed right away. 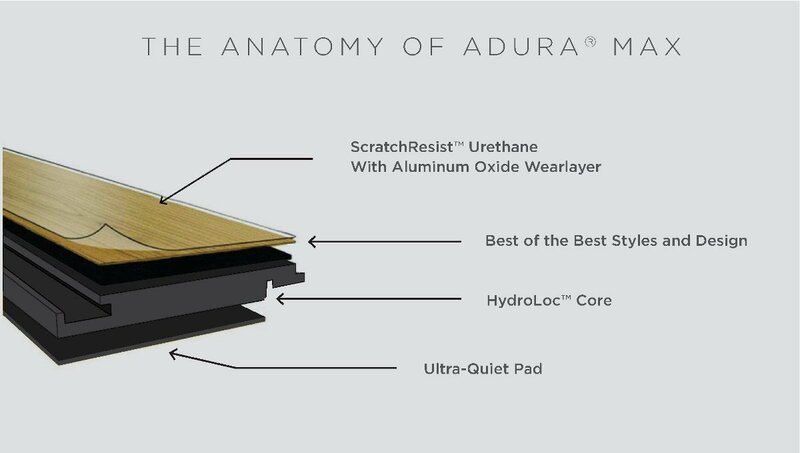 Featuring our patented ScratchResist™ with aluminum oxide surface protection, ADURA Max can stand up to the most active households and offers the industry’s best wear, scratch and stain resistance. ADURA Max is backed with a stress-free limited, lifetime residential and 10-year light commercial warranties against wear through, staining, fading, delamination and joint separation. Mannington ScratchResist™ technology is Mannington’s patented performance coating, with Aluminum Oxide to help keep floors looking newer longer by providing exceptional resistance to everyday household scratches. ADURA® Floors offer environmental advantages such as superior indoor air quality and easy, chemical-free cleaning.